Special Olympics Southern California loves interns! If you're an enthusiastic self-starter who works independently and you have excellent organizational and communication skills, please consider joining the Special Olympics Internship Family. Internships are available across many departments in the regional offices as well as our headquarters in Long Beach. 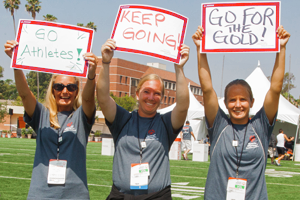 Special Olympics Southern California enriches the lives of athletes with intellectual disabilities and their communities in Southern California through sports, education, and athlete health. Join a network of professionals that all have one thing in common - we all have passion for changing lives through the power of sports. My internship has been a great experience. I’ve seen my work pay off at Summer Games. I get to work with the athletes. Special Olympics is like a family to me. My experience at Special Olympics was amazing and irreplaceable. As an intern, I gained a lot of hands on experience from working at different events and with different people. If I had the chance in the future, I would love to join the Special Olympics team again. Potential candidates must submit resume, cover letter, and any other requirements in the internship application. Due to the high volume of applications, we cannot guarantee a reply to every application received. Those selected for the next step will be contacted directly. All SOSC internships are non-paid. 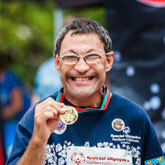 Special Olympics Southern California provides free year-round sports and programs to athletes. Programs are free to the athletes and to their families, so donations are critical to our program. Examples of program expenses include equipment, uniforms, transportation, facility fees, background screening costs, official’s fees and more. In order to support our athletes, we raise funds in a variety of ways – from individual donations, special events, Law Enforcement Torch Run, grants, and more. Our Development team throughout the chapter helps to secure donations with the support of interns and volunteers. If you are looking for ways to gain experience in nonprofit development and management, grant writing, events planning, researching donor prospects, solicitation strategizing, in addition to gaining valuable office experience working in one of the nation's leading sports organizations, look no further! Click on the links below to view the position descriptions – be sure to look at the location of the internship, too! Be the storytellers of SOSC! Our athletes and their families, school partners, volunteers and coaches, and supporters are all superstars and deserve to shine. Our marketing department helps share those stories with the community at large through social media, website content, email campaigns, photographs, printed media, and so much more. With over 150 competitions and dozens of events each year, we sure do have a lot of stories! Marketing and Communications interns play a big role in shaping the content and voice of SOSC. Click on the links below to view the position descriptions – be sure to look at the location of the internship, too! Crossing the finish line. Scoring a point. Celebrating with the team. Special Olympics Southern California (SOSC) is dedicated to moments such as these, because it is through these moments – and all the moments that lead up to them – that our athletes find strength, success, confidence, and joy. SOSC Sports & Field Operations department assists all regions in the development and implementation of sports competitions throughout Southern California. The department assists with coach’s education and athlete training, development of local programs across Southern California, and hosts the championship games each season. Regional Sports Management Interns work closely with local Special Olympics staff in both coordinating and implementing competitions, events, and programs. Click on the links below to view the position descriptions – be sure to look at the location of the internship, too! Along with our stellar athletes and programs, SOSC is a 4 star rated Charity Navigator nonprofit committed to its staff, donors, volunteers, constituents and supporters. Many functions throughout the organization are waiting for dedicated interns like you. Projects are available throughout multiple functional areas. Studying business administration, nonprofit leadership and management, human resources, operations, etc.? – consider joining our intern team! Click on the links below to view the position descriptions – be sure to look at the location of the internship, too! Apply for one of our internships today! Be sure to email a cover letter, resume, and writing sample (if applicable) and send to interns@sosc.org. Applications missing information will not be considered. Have a skill or special project that you don’t see listed? Let’s work together and see what’s possible! Contact interns@sosc.org today! Volunteering is another way to get involved. Whatever your interests, talents, background and availability, there are opportunities for you. Discover a fulfilling career that makes an impact! 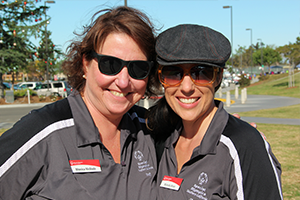 See what jobs are available with Special Olympics Southern California. Please feel free to bookmark and check this page regularly for available internships throughout the semester.